Novelist, playwright and Dante scholar. 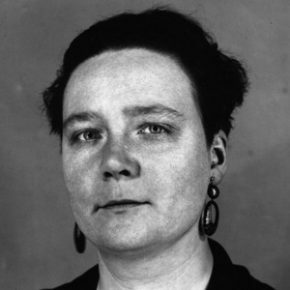 Dorothy L Sayers (1912) read Modern Languages at Somerville, achieving a First in French. She described her days at Somerville as some of her happiest and made several lifelong friendships whilst here. On leaving Somerville, she worked with publishers Blackwells and later moved to London to work in an advertising agency. In the twenties and thirties she published 14 detective novels and short stories featuring the character Lord Peter Wimsey. She remained in close touch with the College after going down, and in 1935 she was elected Chairman of the Association of Senior Members. In the same year she published Gaudy Night, perhaps the most famous fictional account of life in a women’s college (largely based on Somerville itself). The book’s sequel A Busman’s Honeymoon was originally written as a play, co-authored with fellow Somervillian Muriel St Clare Byrne. Following the success of the play, she turned to writing full time and produced a number of plays including the BBC radio drama The Man Born to be King in 1941 – controversial at the time for its portrayal of Christ speaking modern English. After the war, Sayers taught herself Old Italian and embarked on a scholarly translation of Dante’s Divine Comedy – a project which she considered produced her best work. She died prematurely at the age of 64 whilst working on the third volume of Paradiso.